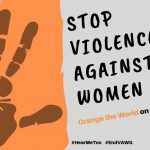 As part of the ‘Her Europe‘ campaign, Young Feminist Europe has teamed up with Soraya Post, member of the European Parliament to host a screening of the documentary The Feminist: A Swedish Inspiration on 8 April 2019. The documentary not only follows the daily life of THE FEMINIST, Gudrun Schyman, but it shows the ups and downs of political life; the public shaming of her struggles with addiction; overcoming her demons; and the founding of Europe’s first feminist party. 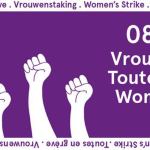 We believe that in the backdrop of the upcoming EU elections, the documentary provides a valuable insight into the social pressures that female political leaders face but it also inspires a vision where a feminist Europe is possible. A 30 minute discussion will follow the documentary with Soraya Post MEP and other feminist leaders. NOTE: Registration via Eventbrite is mandatory. You will need to provide your ID details to access the European Parliament and bring your ID with you that evening. TRAILER The FEMINIST – a love story from Nordic Factory Film on Vimeo. 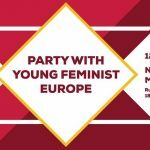 Party with Young Feminist Europe!